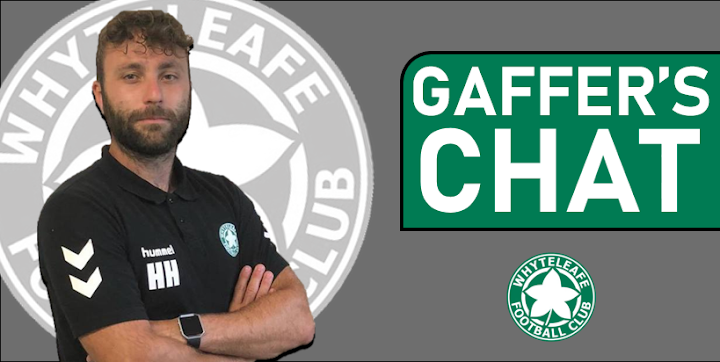 Whyteleafe FC committee member and motoring journalist, Steve Hole, sits down for his weekly chat with Leafe boss, Harry Hudson, for a round-up of the latest developments and results. Harry looks back at last week's away defeat (1-0) at Hythe Town FC and discusses the away trip this Saturday (March 9) at high-flying, Haywards Heath. "After a very informative meeting with Harry Hudson after the recent Phoenix home game, some of us agreed to set up a 12th Man Fund to help out with the first team budget. Some of our players actually don't receive much, if anything, for playing for us and we think this is a good way to raise a few quid. The money raised will go directly to Harry to help supplement his budget. We are asking fans to set-up a small monthly standing order to help fund the team. Up The Leafe..."
Another tough day at the office last Saturday, at Hythe, Harry? Yes, it wasn’t a very good spectacle for either team and neither side deserved to win the game. It was only going to be decided by an individual error or a set piece - in truth it was decided by a combination of both! We’re not really allowed to discuss refereeing decisions here, but what can we say about the decisive penalty decision other than it was er, harsh? Yeah Jamie has received a push in the back which has affected his body shape and his hands have come up. Although he inadvertently gave the penalty away, centre-back Jamie McGeoghan played well on Saturday? I made him our star man in the match report. Jamie was excellent throughout the game - he has had to be patient for his chance and has been a model person throughout even when he would have wanted to play more than he has been. Emmanuel Mensah put in a really good shift last Saturday. What can you tell us about him? He played at right back, is that his natural position? Mannie was a scholar at AFC Wimbledon before signing at Hastings this year. Mannie has some time away from football recently but has come into us and been awesome. He can play at full back or centre midfield. Really great to see Ashley Paul Robinson come on as a sub at Hythe. His injury was a bad one that kept him out for six months? Yes, Ash injured his knee in pre-season and has worked hard to get back. He got another 60 minutes on Tuesday in a friendly against Croydon FC unscathed so it is brilliant to have him back available. He supplied the cross in the 93rd minute that Bryan Akongo so nearly stuck away, too? Bryan should have scored! He usually finishes those chances as well....we deserved a point in my opinion, but that is just the way it is going for us at the moment. Do you still think the play-offs are a realistic proposition, Harry? There are still a lot of points left to play for but the way we are performing at the moment we need to focus on getting that right first before play offs. Harvey Brand has left us to sign for Welling Town? Harvey felt it was the right time to move on. He has y signed for Welling Town in SCEFL div 1. Fixtures don’t get any easier though with a tricky match at Haywards Heath this Saturday (March 16 – 3pm). How do you see this one? True, a tough game - they play to their strengths and are in fantastic form. We are missing a lot of players again so will have to be creative with players and positions to try and get a result. Is your injury list looking less painful this week? No unfortunately not. Bentley is probably out for the season and we haven’t got anyone else back.